Although the Stars and Stripes originated in 1777, it was not until 146 years later that there was a serious attempt to establish a uniform code of etiquette for the U.S. flag. On Feb. 15, 1923, the War Department issued a circular on the rules of flag usage. These rules were adopted almost in their entirety June 14, 1923, by a conference of 68 patriotic organizations in Washington, D.C. Finally, on June 22, 1942, a joint resolution of Congress, amended by Public Law 94-344, July 7, 1976, codified “existing rules and customs pertaining to the display and use of the flag . . 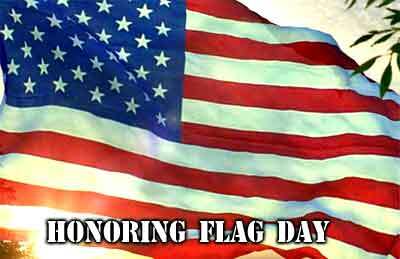 When to Display the Flag—The flag should be displayed on all days, especially on legal holidays and other special occasions, on official buildings when in use, in or near polling places on election days, and in or near schools when in session. Citizens may fly the flag at any time. It is customary to display it only from sunrise to sunset on buildings and on stationary flagstaffs in the open. It may be displayed at night, however, on special occasions, preferably lighted. The flag now flies over the White House both day and night. It flies over the Senate wing of the Capitol when the Senate is in session and over the House wing when that body is in session. It flies day and night over the east and west fronts of the Capitol, without floodlights at night but receiving illumination from the Capitol Dome. It flies 24 hours a day at several other places, including the Fort McHenry National Monument in Baltimore, where it inspired Francis Scott Key to write “The Star Spangled Banner.” The flag also flies 24 hours a day, properly illuminated, at U.S. Customs ports of entry. Flying the Flag at Half-Staff—Flying the flag at half-staff, that is, halfway up the staff, is a signal of mourning. The flag should be hoisted to the top of the staff for an instant before being lowered to half-staff. It should be hoisted to the peak again before being lowered for the day or night. As provided by presidential proclamation, the flag should fly at half-staff for 30 days from the day of death of a president or former president; for 10 days from the day of death of a vice president, chief justice or retired chief justice of the U.S., or speaker of the House of Representatives; from day of death until burial of an associate justice of the Supreme Court, cabinet member, former vice president, Senate president pro tempore, or majority or minority Senate or House leader; for a U.S. senator, representative, territorial delegate, or the resident commissioner of Puerto Rico, on day of death and the following day within the metropolitan area of the District of Columbia and from day of death until burial within the decedent's state, congressional district, territory or commonwealth; and for the death of the governor of a state, territory, or possession of the U.S., from day of death until burial. On Memorial Day, the flag should fly at half-staff until noon and then be raised to the peak. The flag should also fly at half-staff on Korean War Veterans Armistice Day (July 27), National Pearl Harbor Remembrance Day (Dec. 7), and Peace Officers Memorial Day (May 15). How to Fly the Flag—The flag should be hoisted briskly and lowered ceremoniously and should never be allowed to touch the ground or the floor. When the flag is hung over a sidewalk from a rope extending from a building to a pole, the union should be away from the building. When the flag is hung over the center of a street the union should be to the north in an east-west street and to the east in a north-south street. No other flag may be flown above or, if on the same level, to the right of the U.S. flag, except that at the United Nations Headquarters the UN flag may be placed above flags of all member nations and other national flags may be flown with equal prominence or honor with the flag of the U.S. At services by Navy chaplains at sea, the church pennant may be flown above the flag. When 2 flags are placed against a wall with crossed staffs, the U.S. flag should be at right—its own right, and its staff should be in front of the staff of the other flag; when a number of flags are grouped and displayed from staffs, it should be at the center and highest point of the group. Church and Platform Use—In an auditorium, the flag may be displayed flat, above and behind the speaker. When displayed from a staff in a church or in a public auditorium, the flag should hold the position of superior prominence, in advance of the audience, and in the position of honor at the speaker's right as she or he faces the audience. Any other flag so displayed should be placed on the left of the speaker or to the right of the audience. When the flag is displayed horizontally or vertically against a wall, the stars should be uppermost and at the observer's left. When used to cover a casket, the flag should be placed so that the union is at the head and over the left shoulder. It should not be lowered into the grave nor touch the ground. How to Dispose of Worn Flags—When the flag is in such condition that it is no longer a fitting emblem for display, it should be destroyed in a dignified way, preferably by burning. When to Salute the Flag—All persons present should face the flag, stand at attention, and salute on the following occasions: (1) when the flag is passing in a parade or in a review, (2) during the ceremony of hoisting or lowering, (3) when the national anthem is played, and (4) during the Pledge of Allegiance. Those present in uniform should render the military salute. Those not in uniform should place the right hand over the heart. A man wearing a hat should remove it with his right hand and hold it to his left shoulder during the salute. Prohibited Uses of the Flag—The flag should not be dipped to any person or thing. (An exception—customarily, ships salute by dipping their colors.) It should never be displayed with the union down save as a distress signal. It should never be carried flat or horizontally, but always aloft and free. It should not be displayed on a float, an automobile, or a boat except from a staff. It should never be used as a covering for a ceiling, nor have placed on it any word, design, or drawing. It should never be used as a receptacle for carrying anything. It should not be used to cover a statue or a monument. The flag should never be used for advertising purposes, nor be embroidered on such articles as cushions or handkerchiefs, printed or otherwise impressed on boxes or anything that is designed for temporary use and discard; or used as a costume or athletic uniform. Advertising signs should not be fastened to its staff or halyard. 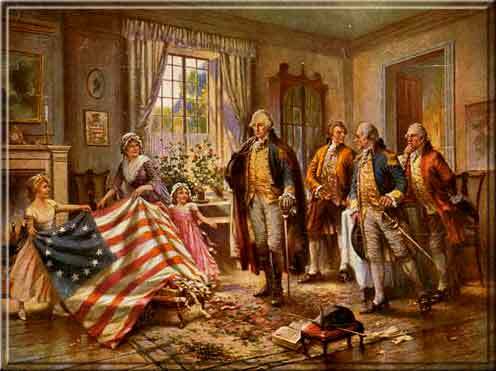 The flag should never be used as drapery of any sort, never festooned, drawn back, nor up, in folds, but always allowed to fall free. Bunting of blue, white, and red, always arranged with the blue above and the white in the middle, should be used for covering a speaker's desk, draping the front of a platform, and for decoration in general. An act of Congress approved on Feb. 8, 1917, provided certain penalties for the desecration, mutilation, or improper use of the flag within the District of Columbia. A 1968 federal law provided penalties of as much as a year's imprisonment or a $1,000 fine or both for publicly burning or otherwise desecrating any U.S. flag. In addition, many states have laws against flag desecration. In 1989, the Supreme Court ruled that no laws could prohibit political protesters from burning the flag. The decision had the effect of declaring unconstitutional the flag desecration laws of 48 states, as well as a similar federal statute, in cases of peaceful political expression. The Supreme Court, in June 1990, declared that a new federal law making it a crime to burn or deface the American flag violated the free-speech guarantee of the First Amendment. The 5-4 Court decision led to renewed calls in Congress for a constitutional amendment to make it possible to prosecute flag burners. Francis Bellamy, a former member of Youth's Companion editorial staff, publicly claimed authorship of the pledge in 1923. In 1939, the United States Flag Association, acting on the advice of a committee named to study the controversy, upheld the claim of Bellamy, who had died 8 years earlier. In 1957 the Library of Congress issued a report attributing the authorship to Bellamy.